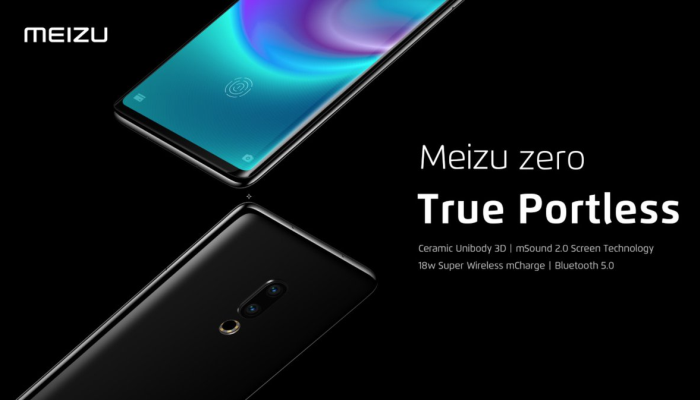 Meizu Zero Launched as World’s First Holeless Smartphone - Playfuldroid! Meizu Zero has gone official in China. It is the world’s first smartphone to feature holeless design. Also, it is also the first smartphone to carry support for 18W wireless charging. The Meizu Zero is equipped with a 5.99-inch curved OLED display that offers full HD+ resolution and tall aspect ratio. The rear said of the phone is made out of ceramic which curves towards the edges. The unibody ceramic build of the Meizu Zero has not ports or physical buttons. The handset features pressure-sensitive virtual buttons on its right and left edges. The display of the Meizu Zero is equipped mSound 2.0 screen sound technology. It allows the phone to emit sound through the display which eliminates the need for an earpiece. The fingerprint scanner is embedded under the display of the smartphone. The Meizu Zero is powered by the Snapdragon 845 chipset which is assisted by LPDDR4X RAM. The Android 9 Pie OS is preinstalled on the device which is customized with Flyme 7 UI. There is no confirmation on the battery size of the phone. However, it is the first phone ever to support 18W wireless fast charging. Instead of physical SIM card, the Meizu Zero supports eSIM card and for listening to audio, user link Bluetooth earphones to the phone through Bluetooth 5.0 LE.